The issue of gender differences and gender stereotyping play an important role in the career counselling, choices, and placement processes in professional institutes. The beliefs formed on the basis of the attitude of simplification accentuates the association between particular professional categories and gender. In other words, certain professions are considered appropriate for female professionals and certain others are regarded good for their male counterparts. It is generally assumed that that gender stereotypes diminish when academic excellence is given primary importance in our premier institutions like Indian Institutes of Management (IIM). These issues were at the center of a National Seminar held on 18 March 2019 at IIM Kashipur (Uttarakhand) recently. The Seminar was sponsored by the National Commission for Women and organized by the Center for Public Policy and Government at IIM Kashipur. 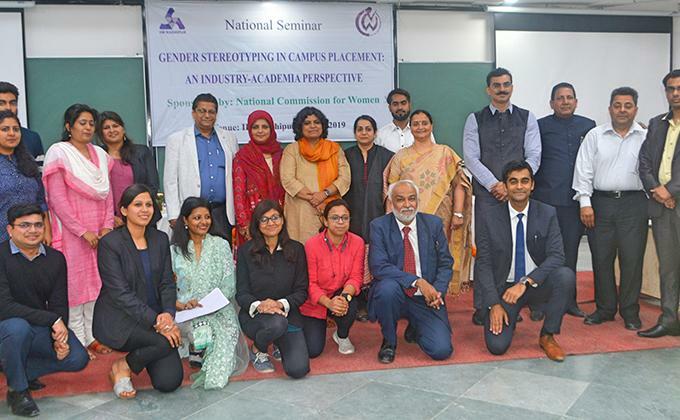 Smt Chandramukhi Devi, Hon’ble member of the National Commission for Women (NCW) congratulated IIM Kashipur for organizing a seminar on gender issues which are in sync with the current objective of the commission in sensitizing people about gender stereotyping and persecution. She recollected her experiences and struggles since her childhood to being the member of NCW and how her background facilitated in the better understanding of women related issues. She emphasized on both women empowerment and liberation. Smt Meenakshi Gupta, Member-Secretary of NCW lauded the organizers on choosing a real and relevant topic. She asserted that unless women are not empowered the process of development would not be possible. She talked about the issues of social, political and economic empowerment of women. She emphasized that women should be considered as equal partner in society. She said if we look at international statistics the political empowerment of women in India is rather significant, we need to change the mindset of the society. Creation of policies is not sufficient- an awareness is the solution. “Development of the nation is not possible unless the entire process is engendered but sadly it is endangered”- said Smt Gupta. Earlier welcoming the guests and delegates, Prof Baharul Islam, Dean of IIM Kashipur, highlighted the background of the event and encouraged the participants to evolve a new perspective in campus recruitment through the interactions between industry representatives and the members of the academia. The seminar was attended by more than fifty researchers, experts, faculty from a number of universities as well as a number of industry executives. Among the prominent resource persons were – Prof Pampa Mukherjee (Punjab University), Prof Zillur Rahman (IIT Roorkee), Prof Imran Saleem, Prof Salma Ahmed (AMU Aligarh), Prof Vijaya Rani Dhoundiyal (Kumaon University and Dr Lalit Prabha Sharma (Almora). Among the prominent industry representatives were Ms Rashmi Mansharamani (CHRO, Wave Group), Sri D K Srivastava (IGL Ltd) and Sri Vishal Kulshrestha (Ahok Leyland). A number of thematic research papers were presented and discussed. It is planned that a special reference volume will be published soon based on the conference under the IIM Kashipur knowledge series.